Want to help make the Southern-Fried Gaming Expo a blast for everyone? 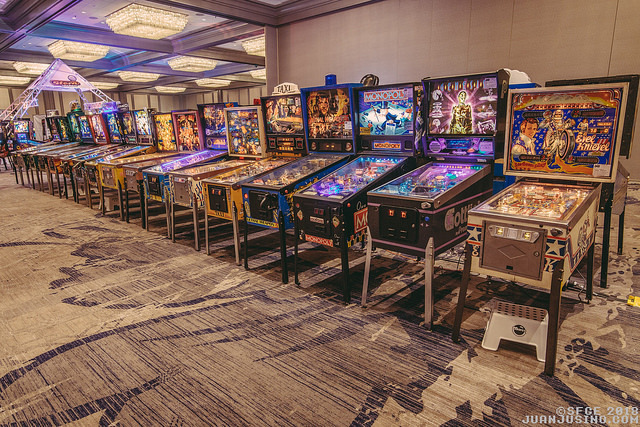 Sign up to bring a arcade or pinball game (or three!) for the weekend and receive free admission and lots more! NOTE: Limit 4 weekend passes per person but number of raffle tickets for Prize Drawing depends on the number of machines you bring. SFGE does not condone illegal, counterfeit, or non-licensed games. Register your games below. If you are interested in bringing a game (or three!) to the 2019 Southern-Fried Gaming Expo, please fill out the form below. All information will remain private among the event organizers. Your game is conditionally accepted after this submission but we reserve the right of refusal. This is rare but could happen due to duplicates, space, etc. Enter the games you would like to bring to the show below. Tabletop game do not qualify for ADMISSION. We will contact you to approve your request. Thanks for make SFGE a great show! We couldn't do it without each of you.